For close to 17 years, the men’s 400m world record of 43.18 seconds set by American Michael Johnson in August 1999 seemed unbreakable. Many track fans wondered if this record would ever be broken. Over the years, Americans Quincy Watts (43.50), Jeremy Wariner (43.45) and LaShawn Merritt (43.65) seem to be the heir apparent to continue the U.S. stranglehold on the men’s 400m world record. After all, since 1968 the 400m world record was held by Americans Lee Evans (43.68- October 18, 1968), Butch Reynolds (43.29- August 17, 1988) and Michael Johnson (43.18 – August 26, 1999). Over the last few decades, with the exception of Grenada’s Kirani James, the U.S. had continued its dominance in the men’s 400m as evidence by its deep 4x400m relay pool. But at the 2016 Rio Olympics, a 24 year old South African named Wayne Van Niekerk changed everything. 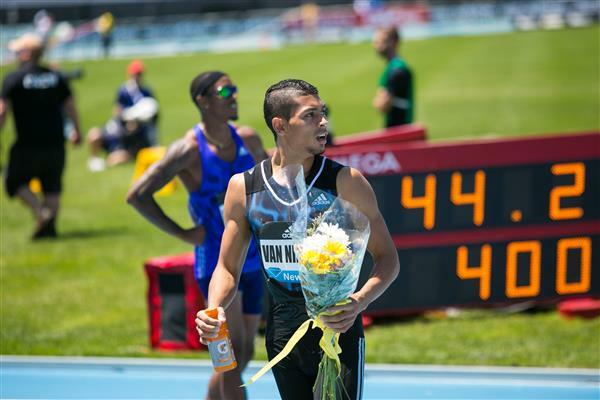 Van Niekerk showed up in Rio and had one of the most memorable performances when he won the men’s 400m title in a new world record time of 43.03 seconds ahead of Grenada’s Kirani James (43.76) and LaShawn Merritt (43.85). What was also impressive about Van Niekerk performance was the fact that he set the world record on what many track fans considered to be a relatively slow track. Van Niekerk became the first man to win the Olympic 400m title running out of lane 8. Van Niekerk world record performance was totally unexpected. After all, the past few decades, saw many athletes emerged and then quickly disappeared. However, last year Van Niekerk showed some signs that he could be a potential threat to the world record when he won the men’s 400m title at the 2015 Beijing world championship in a brisk time of 43.48 seconds ahead of Merritt (43.65) and James (43.78). A year later he is the world-record holder. Van Niekerk is a unique talent who possesses the rare combination of speed and endurance. He is the only man to have gone sub-10 seconds in the 100m (9.98), sub-20 seconds in the 200m (19.94) and has the third fastest time ever in the 300m (31.03). Van Niekerk speed-endurance is remarkable and at age 24, he has the time and ability to go even faster. Van Niekerk is coached by 74 year-old Anna Botha, his college coach at the University of the Free State, Bloemfontein, South Africa. Botha has been Van Niekerk coach since 2012 and she has guided his dramatic improvement over the years and even visited Racers Track Club, in Jamaica earlier this year. Time will tell whether Van Niekerk world record time of 43.03 seconds will stand the test of time.